Then Elijah said to Elisha, "Stay here; the Lord has sent me to the Jordan." Fifty men of the company of the prophets went and stood at a distance, facing the place where Elijah and Elisha had stopped at the Jordan. Elijah took his mantle, rolled it up and struck the water with it. The water divided to the right and to the left, and the two of them crossed over on dry ground. As they were walking along and talking together, suddenly a chariot of fire and horses of fire appeared and separated the two of them, and Elijah went up to heaven in a whirlwind. Elisha saw this and cried out, "My father! My father! The chariots and horsemen of Israel!" And Elisha saw him no more. Then he took hold of his own clothes and tore them in two. He picked up the mantle that had fallen from Elijah and went back and stood on the bank of the Jordan. Then he took the mantle that had fallen from him and struck the water with it. "Where now is the Lord, the God of Elijah?" he asked. When he struck the water, it divided to the right and to the left, and he crossed over. "Now I am going to him who sent me, yet none of you asks me, 'Where are you going?' Because I have said these things, you are filled with grief. But I tell you the truth: it is for your good that I am going away. Unless I go away, the Counselor will not come to you; but if I go, I will send him to you. . . .
"I have much more to say to you, more than you can now bear. But when he, the Spirit of truth, comes, he will guide you into all truth. He will not speak on his own; he will speak only what he hears, and he will tell you what is yet to come. He will bring glory to me by taking from what is mine and making it known to you. All that belongs to the Father is mine. That is why I said the Spirit will take from what is mine and make it known to you." Elijah represented the Lord as the Word, which is the genuine doctrine of truth. Elisha continued that representation. And the mantle symbolized divine truth in general, which is the Word in its most external form. . . . Elijah's mantle falling upon Elisha symbolized the transfer to Elisha of that representation of the Lord as the Word. . . . Dividing the waters of Jordan with Elijah's mantle, first by Elijah and afterwards by Elisha, symbolized the power of Divine truth in its most external form. The waters of Jordan symbolize the first truths through which people are introduced into the church--and these first truths are the kind that are in the most external level of the Bible. "Inheriting the mantle." It is a phrase that comes to us from this story of Elisha's mantle--or cloak--falling from him as he was carried up to heaven in the whirlwind, and Elisha, the junior prophet who traveled with Elisha as his student, picking it up and receiving with it "a double portion" of Elijah's spirit. And just as Elisha then had to take a position of leadership, it has come to mean inheriting not only the spirit, but also the responsibilities of our elders. That is exactly what I want to talk to you about today. And though our services usually focus on our spiritual life and growth as individuals, today I would like to broaden the scope and look at our spiritual life and growth as a church. When I attended this church as a youth in the 1970s, during the first half of my father's pastorate, I remember there being many elderly people in the church. I could name some of them, but I'd certainly forget others. Those of you who have been with this church that long will remember them anyway, whereas to the rest of you, the names would not mean very much. Today, as we look around the church, hardly any of that generation is left. In fact, unlike the usual conception of the smaller church as consisting most strongly of the elderly, we are rather short of elders in our church. While it is a hopeful sign for the church that the bulk of its current membership still has decades of life stretching out ahead, it can also be a little disconcerting to realize that the people who used to run our church when we were younger aren't here anymore. Now it's up to us. The mantle has fallen from our elders to the very people who are sitting in this church today, along with the others who don't happen to be here today. It is up to those who regularly take part in our services and activities; who attend our meetings, plan our programs and activities, and handle all the many details of keeping the church going. We are now the church. There isn't any other church but us. Yes, we have also inherited some money from the earlier days of our church. 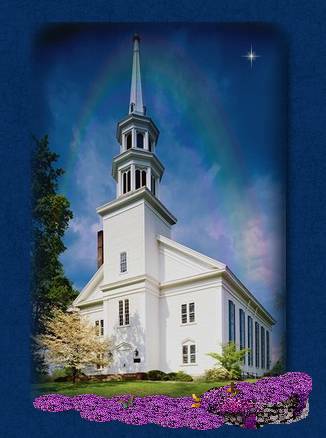 Even the financial support we receive from the denomination and from our Massachusetts Association comes almost entirely from the investment income derived from money donated to the church many, many years ago. But along with that money, we have inherited the church itself. The mantle of the Swedenborgian Church has fallen on our shoulders more and more, as we have seen our beloved elders taken up into heaven to be with their loved ones who went before them. For many of us, this may not be a welcome turn of events. It was more comfortable--and less work!--when there were others older than ourselves to keep the place going, and to look up to as mentors and guides. It's a little like the difference between Christmas as a child and Christmas as an adult. The children have a lot more fun. Why? Because they're not the ones making Christmas happen! They can just soak it all in, while their parents and grandparents do all the work, and then pay all the bills. It is easy to come to church each week and soak in the service, to attend the different workshops and programs while others are planning and running them, and doing the rest of the work of keeping the church going. But when we have to do it ourselves, we realize how much work it is to keep even a smaller church like this one going. And we may long for the "good old days" when others did most of the work, and we could just sit back and enjoy it. But there is another side to this story. One of the problems of Christmas as kids is that you are at the mercy of your parents (and grandparents, aunts, and uncles) as to what gifts you will be given. You may have desperately wanted those Rock 'em Sock 'em Robots, but your parents didn't like fighting games, so they wouldn't get them for you. Or you may have desperately wanted that big make-up kit, but your parents thought you were too young for make-up--and you didn't have enough money to buy it for yourself. So you had to settle for other presents that may have been good, but they weren't the thing you wanted most. Similarly, in the church it is a lot easier to let our elders run things. But as younger people, we didn't always like the way they ran things. They had their particular notions of how a church and a Sunday School ought to be run. Even if we had different ideas, they were still in charge. And as long as they were running the show, the show was going to be run the way they wanted it to be run. This could sometimes leave us out in the cold. Each of you who attended this church as a younger person, or who attended a different church, can probably remember ways you thought the church could be better, but knew that the elders of the church would never stand for it. Some of you may have left your original church because it simply wasn't serving your spiritual needs. Some may have left this church, and come back later when your own life circumstances changed and you felt the need of it. And we know that many have left, and so far have not come back. One of the problems of the older generation running the church is that sometimes their idea of what the church should be just doesn't do much for the younger generation--and the church is in danger of losing the younger group. Of course, there are other reasons people leave the church, which may have nothing to do with the way the church is run. But when we think about it, we realize that the "good old days" were never quite as good as we fondly remember them when our life in the present begins to feel too much like a grind and a rat race, and we long for the times when someone else did all the work. However, the other side of this question is that when we are the ones running the church, we can arrange the church so that it better fits our idea of what church really means. We can move forward in areas where our elders thought things were just fine the way they were. And at the same time, we can look forward and outward to others who may come along in the future, and to the younger generations coming after us, and work to keep the church moving forward so that it will meet their spiritual needs as well. The core of my message for you today is this: you are the church. And we can make this church into whatever we want it to be. If there are parts of it that we inherited from our elders that we still like, we can keep those parts. If there are other parts that our elders may have liked, but that don't do much for us, we don't have to keep doing things that way. We can renew the church in ways that are more meaningful to us. We have already done this in many areas. It is an ongoing process. Before I came here, the church changed its service time in order to have a coffee hour where we could get together, enjoy one another's company, and get to know each other better--not to mention having a chance to welcome newcomers into our church family. Since I came, we have gradually moved to more variety in our worship service, bringing in services that focus on praise or thankfulness in addition to the focus on repentance of our traditional First Order of Service. More recently, we made a major change in the way we run our Sunday School, so that instead of meeting an hour before church, the children now join us for the beginning of the service, and have their classes during the rest of our service. And we have made many other changes, small and large. Some of us may mourn the passing of the old in some of these areas. We had grown familiar with our church the way it was, and it doesn't feel quite so much like "real" church to us anymore. Others, perhaps, couldn't wait for things to change in one area or another, and don't miss the old at all. And some of us may be anxious for still more change to happen. This is all part of the normal process of change and growth in a church. In our individual lives we have to give up our old ways, and even our old friends and family members, before moving into a new phase of our lives. These partings can sometimes be very painful. And yet, they are necessary to keep us from stagnating. They are necessary to keep our lives flowing, moving forward, moving toward greater love and understanding, toward more compassion and responsibility for one another, toward living more and more in the image and likeness of the Lord our God. It is the same in the church as a body. We may mourn the passing of the old. But the Lord purposely arranges that "the only constant in this universe is change." In nature, the only things that don't change, move, and grow (at least in our time frame) are things that are not alive. And the church is a living, growing entity, not an inanimate rock. It must continually be renewing itself: leaving behind the old and moving into new territory. If this makes us uncomfortable, we can at least know that we are not alone. In our New Testament reading, Jesus is preparing his disciples for the time when he will no longer be physically present with them. He has told them that he is going to go away from them to the one who sent them. In plain language, he was telling them that he--who, you remember, was only thirty-three years old at the time--was going to die, and return to God in heaven. And his disciples were filled with grief because of this. They had been with him only three short years, and now he was telling them that he was leaving them for good? This they could not accept. At one point Peter even took Jesus aside and remonstrated with him. "This will never happen to you!" he said. Jesus' response seems a bit too harsh: "Get behind me, Satan!" he rebuked Peter, "You are a stumbling block to me; for you are setting your mind not on divine things but on human things" (Matthew 16:22, 23). The very vehemence of Jesus' reply to Peter should put us on notice that change--even very painful change--is a part of God's plan for our spiritual growth and eternal well-being. In our Gospel story, as the moment of Jesus' leaving his disciples draws nearer, instead of resistance and rebuke, there is grief and comforting. By this time the disciples have realized that their Lord and Master really is going to leave them. And they are filled with grief. Yet the Lord says to them, "I tell you the truth: it is for your good that I am going away. Unless I go away, the Counselor will not come to you." And then he informs them that he has been holding back on them. "I have much more to say to you, more than you can now bear," he tells them. "But when he, the Spirit of truth, comes, he will guide you into all truth." It is good that the Lord should no longer be physically present with his disciples? How could that be? How could it be better than having him with them every day, teaching them, guiding them, comforting them, encouraging them, showing them by his own powerful example what real spiritual living is all about? How could anything be better than that? Those who have passed into the spiritual world and are bound to us by genuine love are nearer to us and can give us greater help than ever before. They understand us better, they have a more accurate knowledge of our spiritual wants, and they can touch the secret springs of our soul with inconceivably more wisdom and skill. Neither the Lord nor our loved ones who have died are absent from us. In fact, they are more strongly present than ever before, because they are with our spirits, helping and guiding us from within in ways that they could never do while they were here with us on earth. Yet they do this with such a deep regard for our freedom, and with such great love for us as the people we are, that they are willing to leave the decisions about our lives in our own hands. They have also left the decisions about the church in our hands. And now it is our turn to carry forward their work. We have inherited their mantle, which fell from them to us as they went up to heaven. And so I ask in closing: What do you want this church to be? Amen.